I admit that given I did this hall revamp over a period of several weeks, that it makes the title of this post a bit of a stretch, but if I had had a full two days to do it, I could easily have achieved it over a weekend. Honest! This was an easy makeover, and I do often think about doing something a bit more involved like adding some moulding (or yes, molding if you're one of my US readers) under the dado rail, or perhaps tiling the floor. But for now, I was happy to breathe a bit of life back into a grotty neglected area, with a minimum investment, both financial and time wise. Our hall is quite narrow, so there's no opportunity to add a console or shelf. Well, I probably could squeeze something super narrow in, but I don't want it to feel cramped, and I'm often bundling into the house with big packages / children / pushchairs etc, and the last thing I'd want to do is make it any narrower, so I'm sticking to the basics. 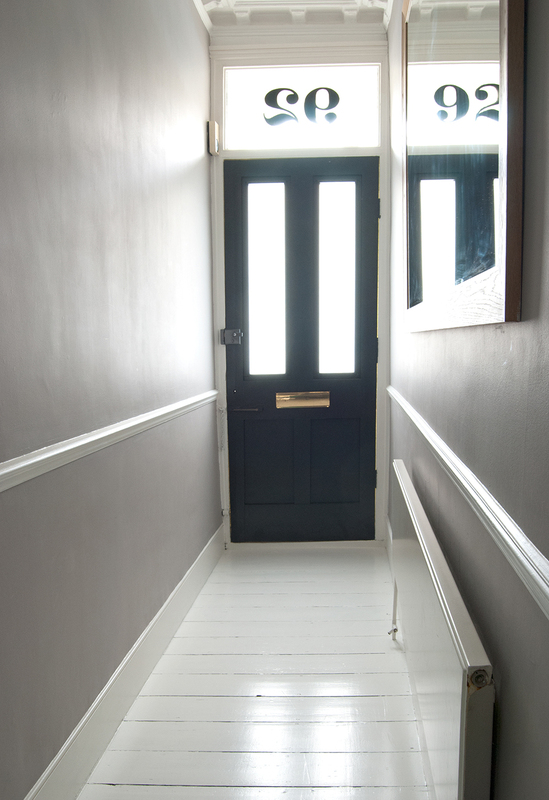 I have relatively recently painted the walls in Farrow and Balls Dove Tale - a very warm grey, but the dado rails and skirtings needed to be painted, and honestly, this was such a quick job once I finally got around to it, and really does make a huge difference. 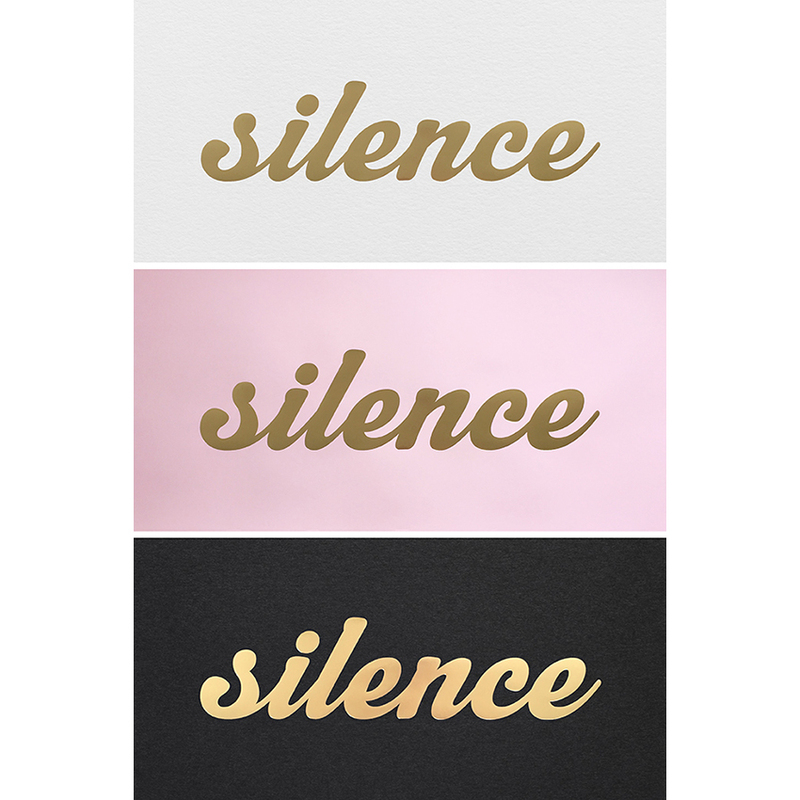 I've used Farrow and Balls Wimborne White on all our woodwork. At one point I painted the dado rail in an eggshell version of the wall colour - a look I like, but I didn't like it in our house for some reason, so back to white it went! I decided to paint the inside of the front door in Railings (yes, also Farrow and Ball) on a whim a few weeks ago, and made the mistake of thinking the frame would look good in railings too. Wrong! It's because the dado rail is white and it just looked wrong where the nearly black met the white, so two coats of undercoat and two coats of Wimborne White later, it's back to white again!! We all make mistakes, right? 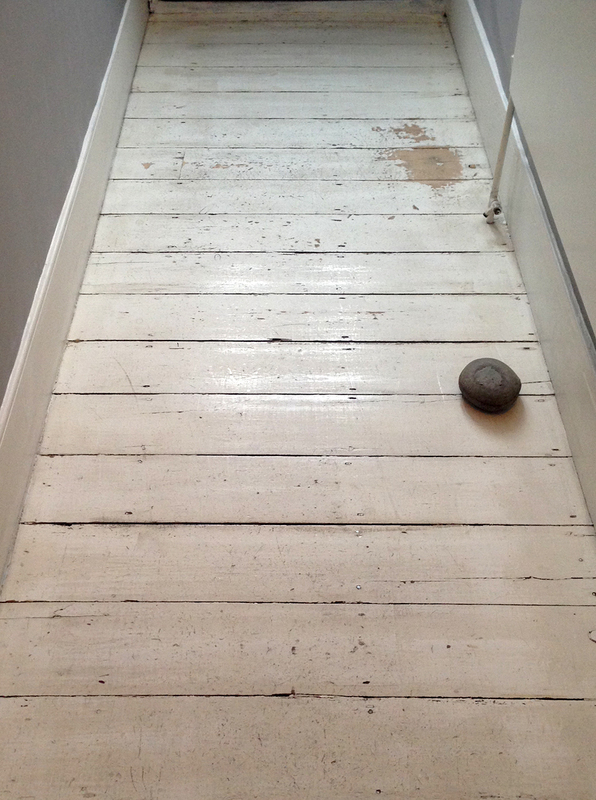 The floorboards were in dire need of some TLC. I'd been putting this job off for literally years, but once I decided to do it, it was pretty painless. Wish I'd done it years ago as it looks great - so fresh and clean, and it makes me hate them a whole lot less! This is what they've looked like pretty much since we moved in over seven years ago. I know, I am hanging my head in shame. They're actually 'clean' here too! A light sand with my electric hand sander and three coats of Farrow and Ball Floor Paint - again in Wimborne White, did the trick. It dries super quickly and you can re coat in four hours - you can easily get it done in one day if you can dedicate the time. 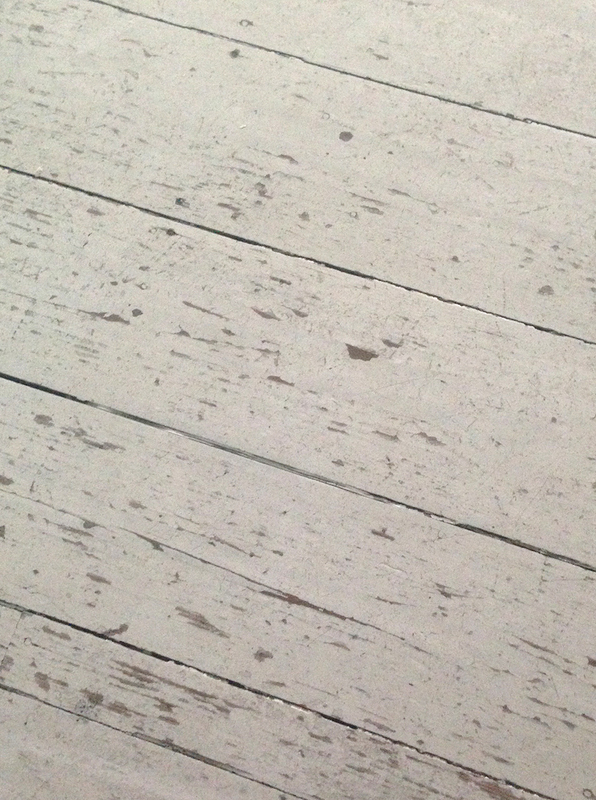 I was hesitant to use Farrow and Ball floor paint to be honest, because it's really very expensive compared to other floor paints. We're talking just shy of £100 for 5L. However, so far so good. I love the colour, the finish is a soft sheen which I much prefer to either gloss or matt for floors, and it seems pretty hardy so far. It has a very thin consistency though, and I imagine three coats is the minimum that you'd ever do, which is a bit of a bummer. 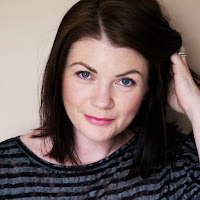 I have to take on the much larger task of the living and dining rooms now, but I think that 5L can will do for everything - I've hardly used much at all for the hall, so maybe that price tag is worth it after all. Most importantly though, it's water-based, so not only does it not smell much at all, but it dries super fast. Yeah, fresh paint is really the star here, you know how much I believe in the power of paint. Don't give me a hard time about that streaky looking mirror okay? You have no idea how many times I cleaned it, but it insisted on looking dirty and streaky in photos. I decided to get a life and go with it, rather than clean it for the twentieth time, or try to photoshop it! 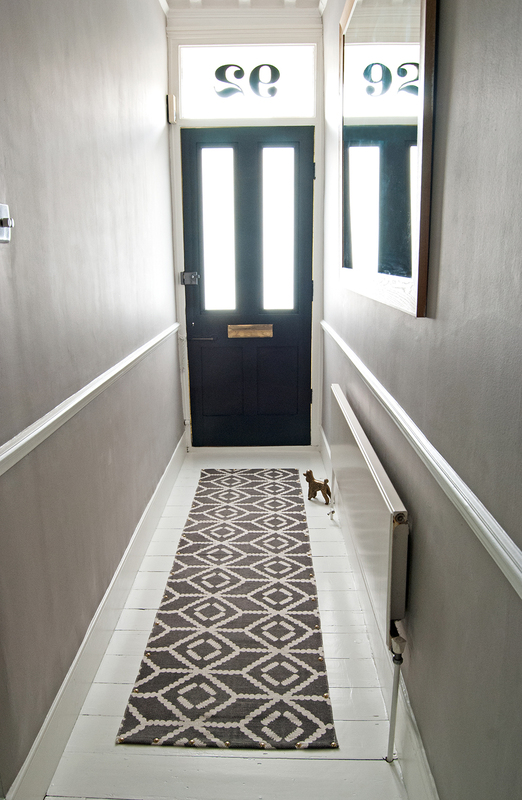 I bought a runner months ago from Urban Outfitters for I think £35, and loved the way it livened up the hall, making it feel a whole lot more welcoming, but no amount of 'non-slip' underlay would keep it in place, in this obviously high-traffic area, and it drove me absolutely crazy having to constantly straighten and reposition it, so I ended up putting it in a drawer, muttering under my breath about how stupid 'non-slip' underlay is. 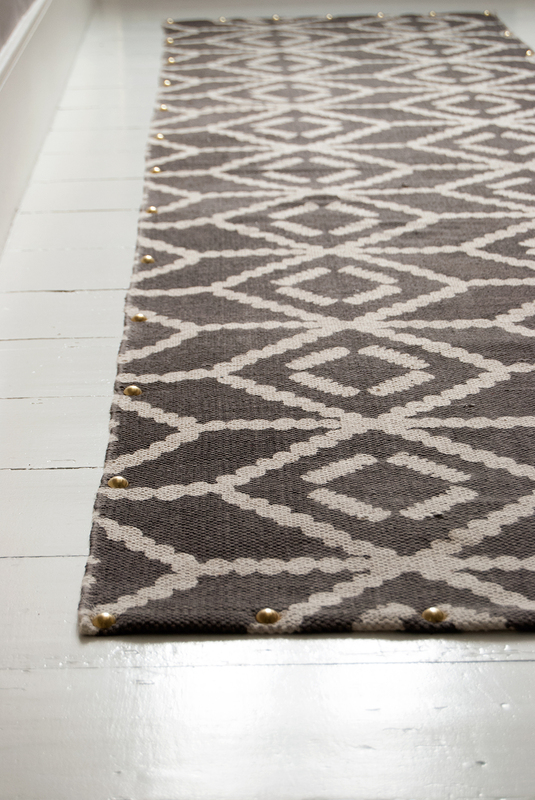 To be fair, it's a light printed cotton rug, I'm sure that non-slip underlay works with heavier rugs, and indeed it seems to in our living room. 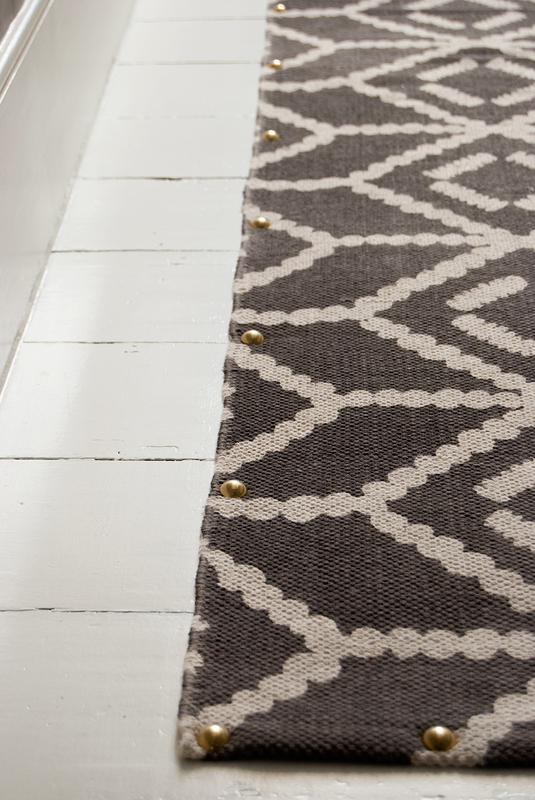 Recently on a(nother) visit to the simply divine Chiltern Firehouse in Marylebone here in London, I noticed that a carpet runner in a busy hallway was secured with carpet studs, not only holding it in place, but the studs add a bit of glam and interest. Bingo! I decided to borrow this trick to use in our hall and I'm so glad I did. That runner isn't going anywhere now, and it looks great. At the ends I placed the studs 10cms apart so as not to create a trip hazard, and 20cms along the sides where it's unlikely to be a problem. 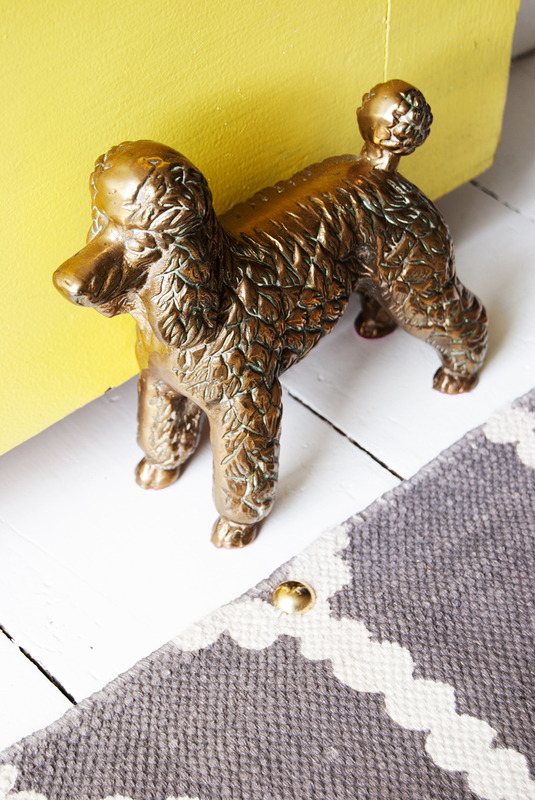 And the icing on the cake, has to be my beautiful solid brass poodle, found on eBay, that works as the perfect doorstop. Our door is heavy and closes on it's own if given the chance. 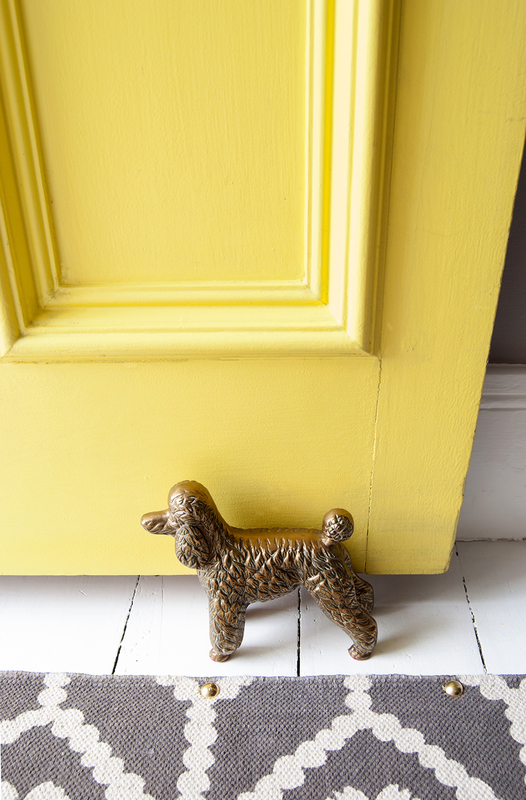 I've had other doorstops that were just not heavy enough, but as the poodle is solid brass I just glued some felt to its feet so it didn't scratch the newly painted floor, it doesn't budge. Et voila! A fresh, clean and inviting hall that didn't cost much at all. Just don't tell my husband that I'm thinking of changing the front door colour, okay? What camera do you use if you don't mind me asking? Hi Sarah, thanks so much! I'm very chuffed that you like my images as it's something I really struggle with and I still have a lot to learn. I use my old Nikon D40X (I think at least 8 years old) just with the standard lens. I really need to invest in a new camera one day soonish. For me it's a LOT of trial and error. And photoshop! Lovely hall! 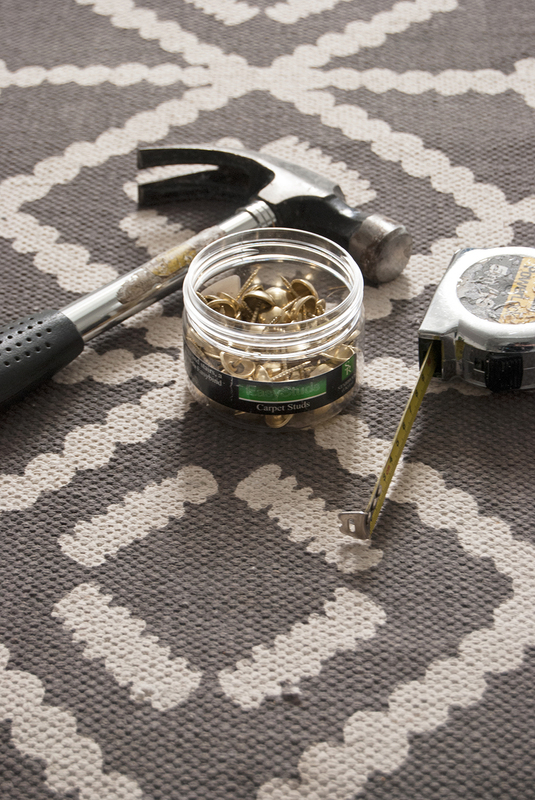 The carpet studs are a great idea,they look so nice. Adds a nice bit of detail! Thanks Lara! I don't know why I never thought of it before - they work a treat!